Also known as garbanzo beans, chickpeas are a roundish, beige to light green member of the legume family grown primarily in part of West Asia, India, and in the Mediterranean. Chickpeas are an extraordinarily versatile ingredient and often form the basis of many varied dishes all over the world. They can be cooked and eaten cold in salads, cooked in stews, ground into a flour called gram flour (also known as besan and used primarily in Indian cuisine), ground and shaped in balls and fried as falafel, fermented to make an alcoholic drink similar to sake, stirred into a batter and baked to make farinata, cooked and ground into a paste called hummus or roasted, spiced and eaten as a snack (such as leblebi), or even preserved in syrup and eaten as a dessert. The success of this dish rests on the quality of its ingredients. Pre-soaked dried organic chickpeas are best but canned will do in a pinch. Parsley is my main “go-to” herb, the one I use most often in my cooking. Where people see it as a garnish, I use it with abandon. This recipe uses A LOT of parsley, as much as two bunches. Rough chop the leaves and reserve the stems for another use, such as stock or sauces. If you omit the cheese and if you use egg-less pasta, it becomes vegan. Gently heat olive oil in a skillet over medium heat. Add garlic and dried chile pepper. Fry until garlic takes on a little color, about 1 minute. Add onion to the pan and cook until until onion becomes softened, stirring frequently. At this point, add chickpeas, half the soaking liquid, the lemon juice and half the parsley to the pan. Turn heat up a little bit. Cook untl chickpeas are warmed thoroughly and the resulting sauce has thickened considerably. It’s difficult to give a time estimation. A good rule of thumb would be if the total volume of liquid has reduced by half or more. Remember that once you add the pasta to the pan, that the pasta will absorb some of the liquid. You want the sauce to be somewhere between “soupy” and “reduced”. If the chickpeas seem too dry, add some more soaking liquid tablespoon by tablespoon. Taste for salt and pepper. When chickpeas are done, add cooked, drained pasta to directly to the pan. Toss to coat. Stir in remaining parsley, add the lemon zest, taste again for salt and pepper and drizzle a little extra-virgin olive oil. Serve at once, passing cheese at the table. * Rancho Gordo chickpeas are an excellent source if you have the time and inclination. Canned is all right, however. This is my submission for Presto Pasta Night #196, a weekly food blog event hosted by Claire of Chez Cayenne and organized by Ruth of Once Upon a Feast. 10 Jan	This entry was published on January 10, 2011 at 6:55 pm. 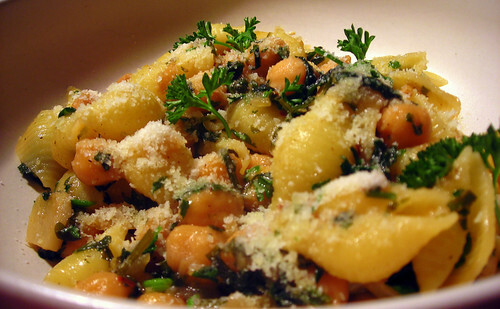 It’s filed under food, general, Italian food, vegetarian, winter and tagged chickpeas, dinner, lemon, parsley, vegetarian. Bookmark the permalink. Follow any comments here with the RSS feed for this post. And this, as usual, sounds DELICIOUS! Yum, chickpeas, parsley and lemon, what a great combination of flavors! Thanks for sending this in to Presto Pasta Nights. I liked your info blurb on chickpeas. Didn’t know that somewhere someone is making an alcoholic drink out of them. The salad sounds excellent as well. I stirred some of that flour (besan) into a lentil soup last night as a thickener, and it also gave a nice creamy consistency. OOh I love chickpeas. This would make a perfect lunch! Definitely worth a giant bookmark. Thanks for sharing with Presto Pasta Night. I really like your description of reducing the sauce. Somewhere between soupy and reduced. It makes much more sense than a time frame. Your food photos are very well done and are a great inspiration to make your recipes.